Water has tremendous power and can wreak havoc on joints, especially knees. Athletes who wish to continue water skiing, wakeboarding or surfing throughout their lives need to take some precautions to protect these vulnerable joints. First and most importantly, the muscles around the knee must be strong, an athlete’s own muscles are the best defense against injury. Anyone who feels unstable in the water must first consider exercising and lifting weights to strengthen the knees. No man-made device can replace an athlete’s own muscles. However, sometimes a previous injury, such as a torn an anterior cruciate ligament (ACL), or a precaution against the sheer force of the water necessitates adding a brace to already bulked-up knees. Many athletes wear braces while participating in extreme sports. In fact, Phil Solven won three King of Wake and Mastercraft Pro Tour titles while wearing a water sports knee brace. This was after he tore his ACL, testifying to the strength and quality of today’s ACL knee braces. 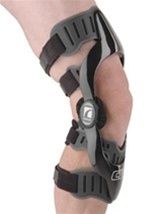 Many knee braces cover the market; however, some braces stand out above the rest. The CTi OTS ligament knee brace has been proved to provide the highest level of support and protection. It is outfitted with anatomically correct Accrutrac hinges and flexible cuffs and buckles. Users love how the rock-solid CTi carbon frame provides a rigid exoskeleton that stabilizes the knee joint. As with all CTi braces, the OTS models are medical devices which may be prescribed by a doctor to reduce out-of-pocket costs. This top of the line knee brace for watersports supports all four crucial ligaments: the ACL, posterior cruciate ligament (PCL), medial cruciate ligament (MCL), and lateral cruciate ligament (LCL). The standard model is great for medium to high impact levels, while the pro sport model is recommended for the highest impact levels. The Donjoy FullForce Knee Brace is a lightweight brace that provides ligament stability and significantly reduces ACL strain. Wakeboarders love how DonJoy's FourcePoint hinge dampens knee joint extension, which increases flexion angles and reduces anterior shear forces on the tibia. The ForcePoint hinge results in less strain on the ACL and a decrease in the change of injury. 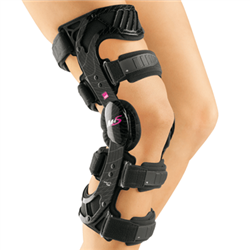 If you have had ACL, PCL or CI reconstructive surgery, this brace is the right choice for you. The Medi USA M4 Knee Brace is also known for the relief and protection it provides to patients with isolated ACL rupture or rupture with collateral ligament injuries and collateral ligament instabilities. The Medi USA M4 Knee Brace provides optimal stabilization due to multi-point fixation joint mobility and limits anterior and posterior tibial glide with collateral ligament stabilization of knee joint. Wake boarders, water-skiers and other athletes love this light brace. The DonJoy Reaction Web Knee Brace is a less expensive knee brace that still provides exceptional support and protection from injuries. It also provides progressive pain relief and sustained comfort. The elastomeric web design absorbs shock and shifts the peak loads away from the painful area of the knee. This dispersion of energy helps reduce the anterior knee pain you suffer from. Watersport enthusiasts love how comfortable, breathable and lightweight this brace is. The purpose of each one of the braces listed above is stability, not curing achy joints and other pain. For these conditions, neoprene braces designed to securely hold the joints and ligaments may be all that is necessary. In addition, the warmth provided by a simple neoprene brace may help alleviate pain. I would not get the don joy web knee brace for water sports! I am a kitesurfer and bought this brace and after 2 minutes of riding the braces came off. The problem with this brace is not the design or fit, just that the velcro straps are too short and a small wave can release it. Go for a slip on instead. Thanks for the heads up, Philip! Some of our other clients have had great results with the DonJoy for wakeboarding since it's doesn't come into much contact with rough water (like waves). What slip on did you try with success?